Kentucky Ancestors Online | Kentucky Ancestors’ Print Archive Goes Digital! Home How To Kentucky Ancestors’ Print Archive Goes Digital! Kentucky Ancestors’ Print Archive Goes Digital! Well everyone, we’ve been promising this for quite sometime, and it’s finally here! You can now access the full run of Kentucky Ancestors print edition back issues, anywhere for free! 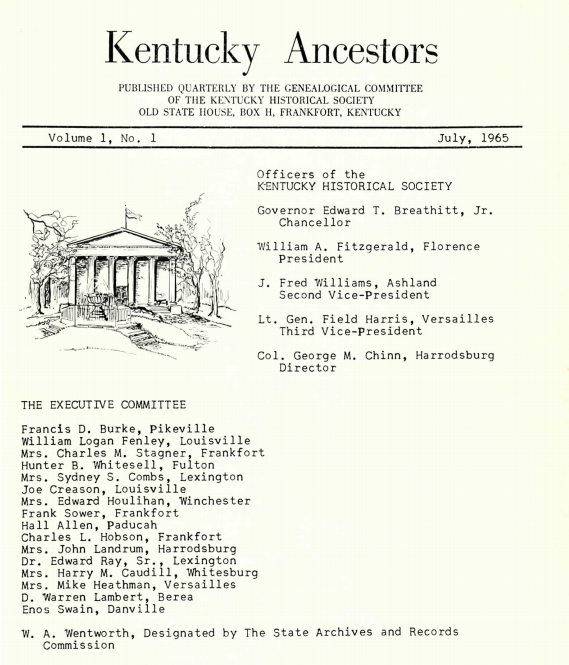 Kentucky Ancestors as a publication began in July of 1965, and ran until summer 2013, when the publication moved to an online only format. All of the back issues from Vol. 1 to Vol. 48 have been digitized and are now available through our Digital Collections Catalog: http://www.kyhistory.com/ However, for easy access per issue, a full list of the back issues has been posted below with clickable links to the PDF version. You can read each issue, or download a PDF version for your records! So begins Kentucky Ancestors Online!